If he didn’t know any better he would say it looked like they were on another one of their “secret dates.” And despite knowing the truth, the thought made him smile. It was one of their rare nights off on their packed world tour, and Jooheon was more than a little excited to be spending it with their maknae. 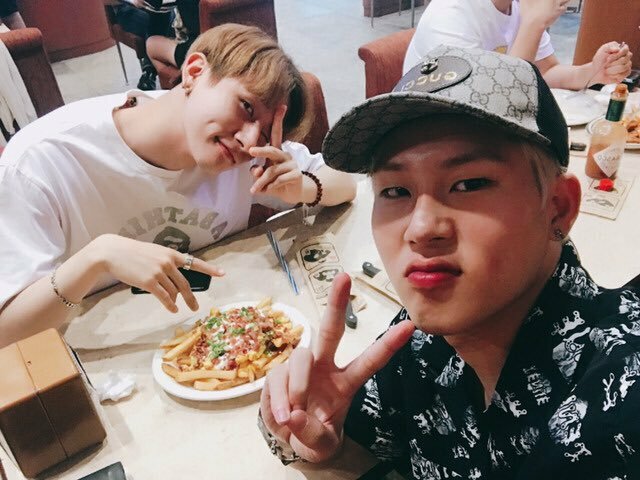 He watched Changkyun as they waited for their order of burgers and loaded cheese fries. The other boy was quietly scrolling through his phone completely oblivious to the older boy’s stare allowing Jooheon the time to (once again) admire him. He honestly thought Changkyun was so pretty. From his delicate dark lashes and his soft pink lips, to the slope of his nose and the scars on his cheeks; everything about Changkyun was just beautiful to him. It was then Changkyun smiled at something on his screen and Jooheon found himself smiling as well, always captivated by the other’s charm. “Ah, the usual.” Jooheon’s smile fell a bit and he turned his eyes to his own drink. They all knew about the ship names and the relationship theories, and unless it was taken to an uncomfortable level, it didn’t bother them too much. They were a close knit group, always publicly showing their love and support for one another, so it wasn’t a big deal. But the one pairing that did bother Jooheon was the one of him with Changkyun. That pairing hit too close to home. He knew he wasn’t supposed to have feelings for the younger, he was his bandmate and their maknae for goodness sake. But there is truth to the old saying that the heart wants what it wants, and aside from a career in music, his heart has never wanted anything more than Changkyun. He was deep in these thoughts when Changkyun reached across the table and placed his hand on top of his own. Jooheon looked down at the delicate hand, noticing its pretty fingers and reveling in its softness. They stayed like that for a moment longer, Changkyun’s hand being held between Jooheon’s, the younger still a bit concerned, but both lost in their own trails of thought until their food came. The boys calmly but quickly pulled their hands apart and nodded their heads towards the waitress in front of them. After she placed their food down and checked if they needed any refills, she left the boys to themselves once again. “Woah it looks so good! 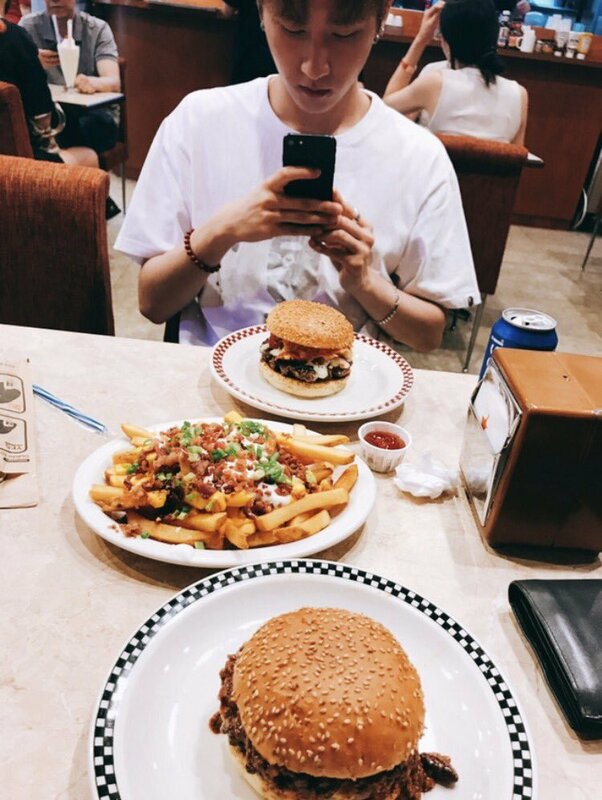 Let me take a pic first.” Changkyun grabbed his phone and began to snap away at his burger. Jooheon agreed, but not about the food. Pretending to angle his camera towards their food he quickly snapped a pic of the maknae. He was just too cute. Unfortunately the younger boy seemed to notice the odd angle, and Jooheon had to think fast. “Hey let’s take one together, yeah?” Changkyun just smiled and agreed, nodding his head as he moved himself to fit into the phone’s frame. They both looked at the photo and deemed it good enough. The two then ate in comfortable silence until Jooheon looked up mid bite and noticed some ketchup on the side of Changkyun’s mouth. Without thinking, he casually wiped it off with his thumb and brought it to his mouth, sucking the substance away. Changkyun watched him in stunned silence and then grabbed his napkin to wipe off any remaining food. Jooheon could feel the heat rise to his cheeks, but continued eating as if nothing had happened at all. He couldn’t help it. Whether he was slinging his arm around the younger boy’s shoulder, giving him back hugs, or any other touchy forms of endearment, Jooheon had grown very physically attached to Changkyun. Being with him and not touching him was just not an option. Jooheon gave a nod of acknowledgement and watched his friend leave the table. After he was out of sight he pulled out his phone and looked at their most recent photo. If he didn’t know any better he would say it looked like they were on another one of their “secret dates.” And despite knowing the truth, the thought made him smile.